The heating hot water or steam from your boiler flows through a radiator heating coil; there an electric fan forces air through the radiator coil, the air passing the coil absorbs the heat from the hot water or steam, culminating in a higher discharge air temperature. The cooler water leaves the coil and is pumped back to the boiler to reheated, and the process starts again. 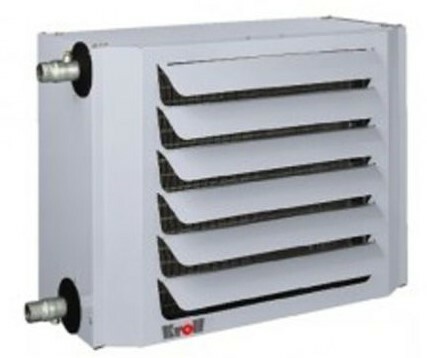 These unit heaters are of compact construction and can be mounted easily anywhere. High reliability, as the only moving part is the fan assembly and motor -and if the motor fails, it is a very simple task to replace. Clean heat with no odours, and no by-products of combustion to flue away or naked flame to worry about ! Multiple unit heaters can be spaced strategically for zoning unique areas within the building, giving you maximum control and efficiency. The FH warm air unit heaters offers cost effective and energy efficient water heating solutions suitable for heating warehouses, heating workshops, heating factories and many more applications. 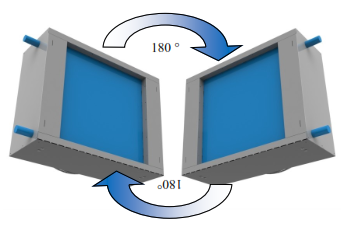 The two discharge options – downward or horizontal – meet all likely space configurations. 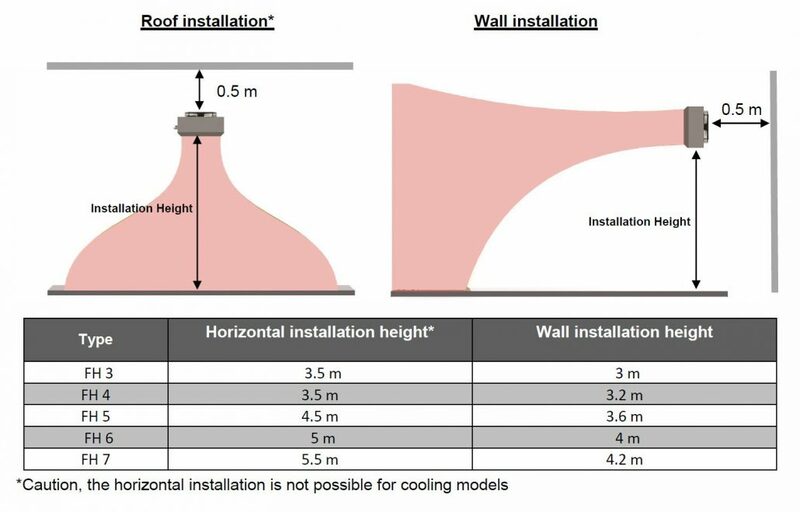 Downward discharge is particularly suited to complex areas where obstacles might impede airflow’s from a horizontal unit. 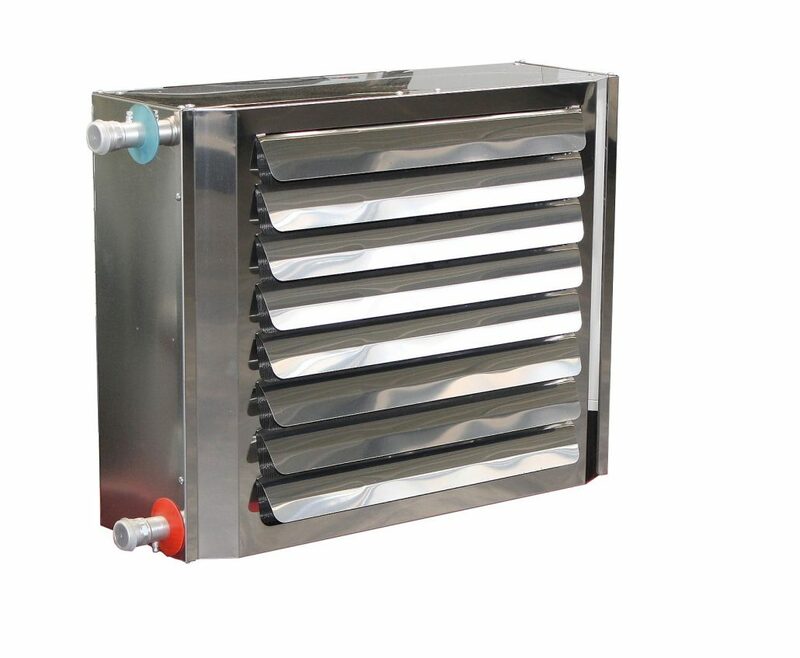 However the horizontal discharge units, with adjustable louvers, are ideal where directional heating (e.g along production lines) is required. 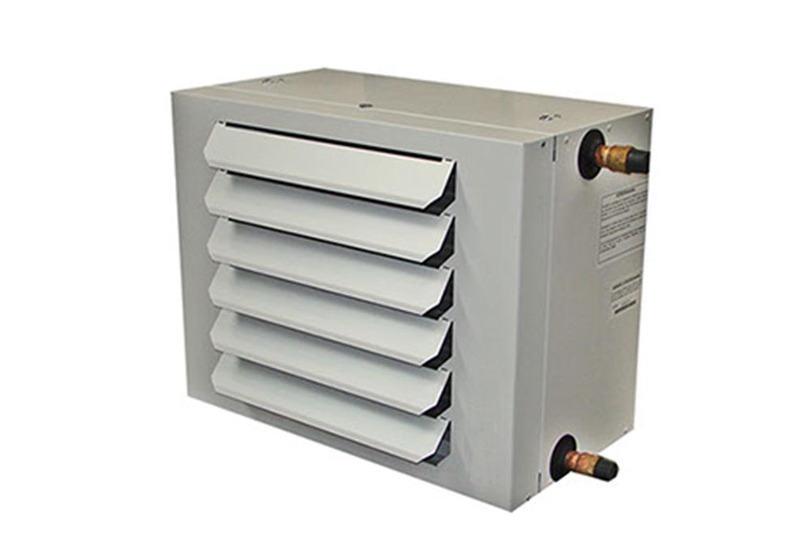 Unit heaters can operate with low temperature hot water as standard, but we can also supply units that use medium or high pressure hot water, or steam. 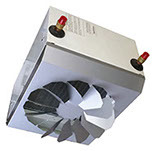 The multi-stage adjustable fans can be adapted to the requests on site. They assure draught-free, area-wide and comfortable distribution of heat and air. 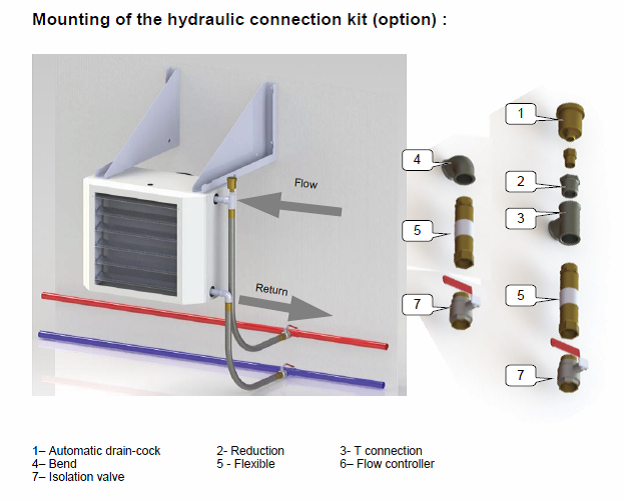 In order to calculate your requirements, our Flexiheat consultant team is at your disposal. How do I calculate the heating load for my warehouse or commercial building? ANSWER: Call us as we are happy to run a heat loss calculation that will help you pick the perfect unit heater or heaters for your site conditions, as you do not want to under size, or oversize the heaters, PLEASE DO NOT FALL for unit heaters that are advertised as “will heat up to 1,200 square feet”. As heating a 1,200 square foot insulated warehouse in Kent, is an awful lot different to heating a 1,200 square foot un-insulated warehouse in Aberdeen. This one heater cannot “magically” service both 1,200 square foot spaces. 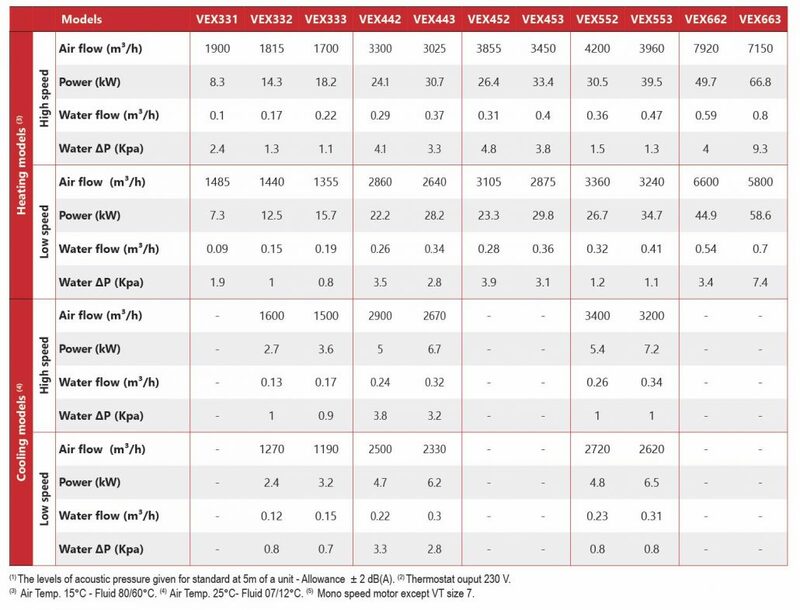 Heat outputs from 10kW to 118kW. The heating hot water or steam from your boiler flows through a radiator heating coil, there an electric fan forces air through the radiator coil ( this is why these unit heaters are sometimes referred to as a forced air unit heater) ,the air passing the coil absorbs the heat from the hot water or steam,culminating in a higher discharge air temperature. The cooler water leaves the coil and is pumped back to the boiler to reheated , and the process starts again. Multiple unit heaters can be spaced strategically for zoning unique areas withing the building, giving you maximum control and efficiency. The Kroll LH warm air unit heaters offers cost effective and energy efficient water heating solutions suitable for heating warehouses, heating workshops, heating factories and many more applications.